"Marashi" redirects here. For other uses, see Marashi (disambiguation). 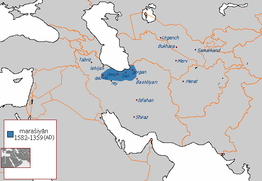 The Marashiyan or Marashis (Mazandarani: مرعشیون) were an Iranian Shiʿite dynasty dynasty ruling in Mazandaran from 1359 to 1596. The dynasty was founded by Mir-i Buzurg, a Sayyid native to Dabudasht. Bosworth, C. E. (1984). "ĀL-E AFRĀSĪĀB". Encyclopaedia Iranica, Vol. I, Fasc. 7. London u.a. : Routledge & Kegan Paul. pp. 742–743. Bosworth, C. E. (1989). "The Encyclopedia of Islam". The Encyclopaedia of Islam, Vol. 6, Fasc. 107-108. pp. 513–640. ISBN 9789004090828. Bosworth, C. E. (1986). "The Jalayirids, Muzaffarids and Sarbadars". In Frye, R. N. The Cambridge History of Iran, Volume 6: The Timurid and Safavid periods. Cambridge: Cambridge University Press. pp. 1–42. ISBN 9780521200943. Madelung, W. "ʿALIDS OF ṬABARESTĀN, DAYLAMĀN, AND GĪLĀN". Encyclopaedia Iranica, Online Edition. Retrieved 12 May 2014. Wikimedia Commons has media related to Marashiyan.